The Wagner expert Barry Millington once suggested how the composer came to choose Der fliegende Holländer as his subject for an opera: ‘Living in squalid lodgings in Paris, Wagner and his wife [Minna] are forced to pawn wedding presents and other silver items to buy food. Uprooted from hearth and home, persecuted by creditors, unfulfilled in love. Wagner identifies himself with the mythical wanderer, the Flying Dutchman.’ Another musicologist Christopher Wintle propounded there was a connection between the Dutchman and the mythical Ahasuerus, the Wandering Jew, because of ‘the privations of a deracinated artist – pre-eminently Wagner.’ Wagner longed for an obedient woman who would serve him and his art, with the self-sacrificing love and blind devotion of Senta to the Dutchman. This wasn’t to be Minna, but he eventually found his soulmate in his second wife Cosima. So, Der fliegende Holländer is clearly a very autobiographical early work from Wagner, though we often read much less about the actual score we are hearing. The earliest versions had just one act with three scenes and the setting was the coast of Scotland. It underwent many changes even before its first performance in Dresden in 1843 and these included dividing the opera into three acts, transferring the setting to Norway and changing the names Donald and George to Daland and Erik. Senta’s ballad was also transposed from the original key of A minor to G minor, which called for a change in instrumentation. Some of Wagner’s revisions of Der fliegende Holländer from his original 1841 score were cogently explained in Longborough Festival Opera’s programme by their music director Anthony Negus. These included how in the wake of Tristan und Isolde a redemption theme was added in 1860 to replace the bleaker Dresden ending and that is what we heard at the end of this performance. 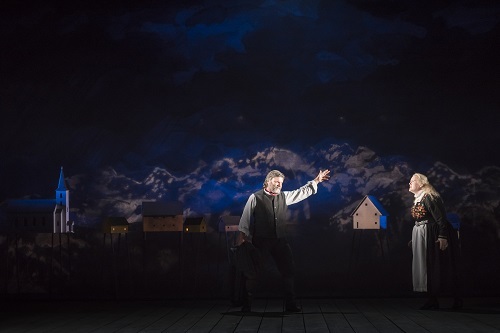 More intriguingly the intimate nature of Longborough’s theatre draws the audience into Wagner’s mindset and that – more than ever before – made me realise a parallel between Holländer and Beethoven’s Fidelio. In the programme I subsequently read that another Wagner authority, the distinguished academic and opera critic Michael Tanner, notes how ‘In both there is a hero who is in desperate need of rescue, and in each case it is a woman whom he has a fantasy of being rescued (“redeemed”) by.’ Tanner neglected to mention how Wagner idolised Wilhelmine Schröder-Devrient, his first Senta, and later claimed to have seen her as Leonore in Beethoven’s opera when he was 16. This was highly unlikely though it is further evidence of a Fidelio/Holländer connection. Loughborough’s quirky 500-seat theatre in its delightful Cotswolds setting is firmly established as a go-to summer awayday for Wagnerians seemingly now – from the languages I overheard – from around the globe. I have reported from there in various guises since 1999 and have enjoyed seeing it gain the enviable reputation it now has. Stage facilities remain limited but go for the music and you can now hear – from the incomparable Anthony Negus and his orchestra – some of the best Wagner you will hear anywhere. Neither three acts nor one this Der fliegende Holländer had a 90-minute supper interval after Act II. Ruth Paton’s designs gave us simply a backdrop of storm clouds to an otherwise bare stage and props included some chairs, books, packing cases and crates, as well as, large nets for the women to mend. Also, a model lighthouse and other small village buildings were either carried about or left at the back. There was some attempt at atmosphere from Ben Ormerod’s lighting with red used especially for the Dutchman and his zombie-like crew. Costumes would have done justice to any staging of Peter Grimes with plenty of oilskins and chunky cable knitwear for the sailors. Apart from a bit of sea shanty-like foot stomping for the men’s chorus mostly there was a lot of slightly distracting ‘rhubarbing’ when everyone was not singing. It was a tale simply told and that is, of course, not a bad thing sometimes. During the overture we meet a Senta who is obsessed by the story of the Flying Dutchman and his likeness in the book she cannot put down. The page with his picture on is later torn out and Senta tries to pin it near her heart before when the opera ends she stabs herself with – I guess – whatever she tried to do that with. As we hear the redemption theme the Dutchman returns to cradle her in his arms. The voice of burly, fully bearded, Simon Thorpe took a little time to get into focus during ‘Die Frist ist um’ but he went from strength to strength. Guthrie’s idea initially clearly concentrates on the Dutchman as the outsider – or ‘Wandering Jew’ if you will – seeking assimilation into a community. Thorpe was vocally and dramatically convincing from his first slow walk into the action right through to his anger and resentment at Senta’s apparent betrayal at the end. Kirstin Sharpin had a very successful Loughborough debut as Senta. She did not have the unrestrained fearlessness of some I have heard yet the controlled refinement she brought to some of her singing perfectly fitted with the small-scale production. Hers was an intense interpretation and Sharpin believably often appeared utterly possessed by her character’s innermost thoughts and feelings. Richard Wiegold was a bluff and grizzled old Captain Birdseye-style seadog. Forthrightly sung, his Daland never seemed particularly avaricious or overly paternal. (When Wiegold and Thorpe were singing together negotiating over the price of Senta’s hand in marriage my mind momentarily thought about the current #MeToo debate, but only fleetingly as this is opera after all!) Carolyn Dobbin was in sumptuous voice as the fussy, concerned, and rather maternal Mary. William Wallace brought a bright and cultured sound to the sleepy Steersman. Jonathan Stoughton was Senta’s hapless suitor, Erik, and over several decades the role’s tessitura has proved too demanding for some of the best heroic tenors when I have seen this opera in the UK or Germany. On this occasion – despite evidence of how good he might have been – it defeated Stoughton too because of an ailment he is hopefully soon to recover from. Oddly there was a cover singer listed for the part in the programme and – assuming he was suitably prepared – it might have been better for the performance and Stoughton’s voice if he had sung instead. In conclusion, I must celebrate the work of Loughborough’s small, yet redoubtable, chorus of sailors, fishermen, and villagers who sang out lustily throughout. Their chorus master, Thomas Payne, deserves a lot of praise for what he has achieved with them. It was a great idea to have the ghostly ripostes in Act III pre-recorded and sounding as if coming out of a transistor radio. With the full support of the orchestra playing at their very best, Anthony Negus was aware – as only someone with Wagner’s music in his blood is – of the intricacies of the score: it was stormy and muscular when necessary yet had nuance and lyricism elsewhere. Negus revealed all the true romantic sweep and dramatic drive necessary to make his Der fliegende Holländer battle the high seas and not become becalmed. For more about Longborough Festival Opera click here.